A baby Java mouse-deer has been born at Bioparc Fuengirola in southern Spain. 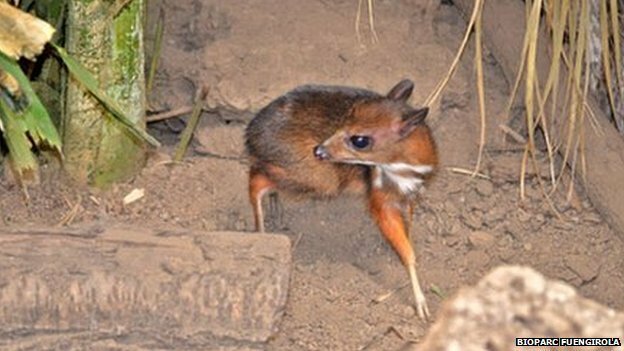 Java mouse-deer is one of the smallest hoofed animals in the world. The newborn deer is “no bigger than a hamster” and weighs about 100 grams, staff at Bioparc Fuengirola told the El Pais newspaper. Adult Java mouse-deer are rarely bigger than rabbits or weigh more than 1kg (2.2lb). They are also known to be fiercely intelligent, and the species represents wisdom in many local legends in its native Java, says The Local website. The baby mouse-deer is the eighth to be born in Fuengirola, which is running a program to breed the rare species. Its mother was born at the same zoo in 2007, and its father came from Zoo Lille in France last year, the Spanish zoo says. The family lives the zoo’s Hidden Forest, which recreates the ruins of a temple lost in the Asian jungle. Bioparc Fuengirola says there are currently 43 Java mouse-deer in Europe, but warns the future of the species is threatened by massive deforestation in South East Asia and the replacement of jungles with oil palm plantations.